The clock didn’t exactly strike midnight for the Chicago Cubs, but when it did strike 6:00 P.M. it was good enough to negate a potential 4-3 win and hand the Boston Braves a 3-0 victory in the second game of a Sunday doubleheader at Braves Field. The Braves won the earlier game as well, 2-1. Boston’s Sunday law, which limited baseball games on those afternoons to 6 o’clock, worked in favor of the Braves in the second game. A big four-run ninth-inning rally for the Cubs went for naught and the score reverted to the end of the eighth inning, when Boston led, 3-0. “Though this decision is not definitely settled and it may take (National League) President John Heydler to straighten out a tangle which probably saved the Tribe from a reverse that sent the Cubs back to their hotel last evening raving at puritanical Boston and the law which beat them out of a likely chance to divide the honors for the day,” wrote Paul H. Shannon of the Boston Post. At promptly 6 o’clock, Boston police Lieutenant Charles B. McCloskey of Station 14 came onto the field and ordered home-plate umpire Jim Scott to call the game. The Cubs entered rigorous protests, but the lieutenant and the umpire remained adamant. Since umpires in the past had ruled that no inning should start after 5:40 P.M. on a Sunday, this game was proceeding ever so close to that bewitching time when the ninth inning began at 5:38. The umpires may have had an inkling that Boston, ever aware of the rule, was stalling for time to drag out the eighth inning. With one out in the bottom of the eighth, Braves captain Rabbit Maranville began to purposely foul off pitch after pitch trying to prolong the inning, before finally striking out on a fouled-off bunt. Then Wally Berger, hoping to wait it out at the plate, took three quick strikes poured over the plate by Cubs reliever Lynn Nelson. It was two minutes ahead of the 5:40 deadline and the game was ordered continued. With the Cubs three runs down and having done little damage against Braves starting pitcher Bob Smith, the umpires likely believed that Boston would make quick work of the visitors. There would be no need to play the bottom of the ninth. However, Chicago had other plans. Hack Wilson led off the top of the ninth with double off Smith and Riggs Stevenson reached safely on a bunt. Charlie Grimm then drove a single that got past Wally Berger in left field, scoring a run and moving runners to second and third. Pinch-hitter Chick Tolson struck out but Doc Farrell singled home a run and then Gabby Hartnett gave Chicago a 4-3 lead when he doubled in a pair of runs. Then, realizing they needed to speed things up in order for the runs to count, the Cubs engaged in a bit of chicanery to quickly bring the top of the ninth to a close. After Braves manager Bill McKechnie summoned reliever Bill Sherdel from the bullpen, Hartnett began to hurry up matters by nonchalantly strolling from second to third, where he was easily caught stealing. Then Clarence “Footsie” Blair purposely fanned for the third out. Leading 4-3, the Cubs quickly took the field at 5:55 P.M., but the Braves refused to go quietly, all the while checking the big clock positioned atop the jury box in right field that loomed toward 6 o’clock. George Sisler opened the bottom of the ninth with a clean single off reliever Charlie Root, the third pitcher of the game for the Cubs. Johnny Neun ran for him and Buster Chatham, repeating Maranville’s stunt by attempting to stall for time by bunting, was finally called out on a fouled third strike. Jim Welsh then bounced a double over the head of first baseman Charlie Grimm, and the Braves now had the tying and winning runs in scoring position. With pinch-hitter Randy Moore, who came on in favor of Bill Cronin at bat, the scoreboard clock read exactly 6 o’clock. Players in the Boston dugout, as well as members of the press corps, were quick to alert the umpires and the Cubs that further play would render the teams liable for an infraction of the Sunday law. The umpires seemed inclined to let the game go on but Lieutenant McCloskey walked out upon the field toward third-base umpire Ernie Quigley and warned them again. Quigley and McCloskey went to the plate and spoke with home-plate umpire Scott, who ordered the game called. The final score reverted to the end of the eighth inning with Boston leading, 3-0. 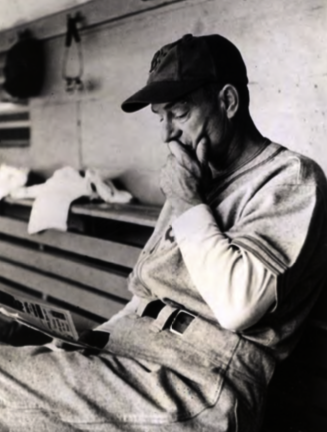 Manager Joe McCarthy left the field quite irate, with the Cubs making threats of a protest. However, while the Cubs did not file an official protest, McCarthy felt that the umpires, in their report to league President Heydler, would explain what the teams were up against regarding the Boston Sunday baseball law. Edward Burns of the Chicago Tribune reported that McCarthy would lodge the protest “on the stalling tactics of the Boston club,” yet made no reference to the similar tactics carried out by the Cubs in the game. “McCarthy thinks a good solution would be to call the game incomplete as of 6 o’clock, then play it to a conclusion with the same personnel,” Burns wrote. "At the time the game actually was halted the Braves were in their ninth inning. Sisler had singled, Chatham had struck out, and Welsh had doubled, Sisler stopping at third. According to the Chicago calculation Sisler is entitled to his single and Chatham his strikeout, but Welsh doubled at 6:01 o’clock, making the blow utterly sinful and null and void. After the field had been cleared, the umpires admitted they knew that Sunday baseball in Boston was legal only between the hours of 2 and 6 but figured 20 minutes would be ample time to play the last inning. On days when teams were forced to make early trains, 12 minutes were allowed for the playing the last inning. The controversial ending sent the reported 31,160 Boston fans home happy, but many fans listening to the game at home over Boston radio station WNAC were left in the dark. Because a show on the station began promptly at 6:00 P.M. on Sundays, the studio left the contest with announcer Fred Hoey in the middle of a detailed explanation of what was going on. Many callers besieged the radio station as well Boston as newspaper offices to get the final word on what had just happened. Four days later, Heydler after a hearing with Veeck and Emil Fuchs, president of the Braves, disallowed the protest, and the 3-0 Boston victory held up. As things turned out, the victory-turned-defeat may have played a part in the 1930 National League pennant race, which ended with the Cubs in second place, two games behind the St. Louis Cardinals. Had the Cubs won the Braves game, the final days of that pennant race might have taken on a different complexion and perhaps manager McCarthy — who was fired with four games left in the season — would not have lost his job to Rogers Hornsby. This article appeared in "Braves Field: Memorable Moments at Boston's Lost Diamond" (SABR, 2015), edited by Bill Nowlin and Bob Brady. To read more articles from this book, click here. Boston Herald, July 14, 1930. Boston Post, July 14, 1930. Boston Record, July 14, 1930. Chicago Tribune, July 15 and 18, 1930.